Calories: White meat = 161 calories. Dark meat = 192 calories. Fat: White meat = 4 grams. Dark meat = 8 grams. Protein: White meat = 30 grams. Dark meat = 28 grams. Iron: White meat = 1.57 mg. Dark meat = 2.4 mg.
Zinc: White meat = 2.08 mg. Dark meat = 4.3 mg.
Thiamine: White meat = .04 mg. Dark meat = .05 mg.
Riboflavin: White meat = .13 mg. Dark meat = .24 mg.
Selenium: White meat = 32.10 mcg. Dark meat = 40.90 mcg. Folate: White meat = .01 mcg. Dark meat = 10 mcg. So don’t skip breakfast. Turkey sausage and eggs is full of protein and with a slice of whole grain bread, it’ll keep you going for hours. How about making your own breakfast sandwich with a whole grain english muffin, a fried egg, and a turkey patty. Note to self: Add that to my bucket list. 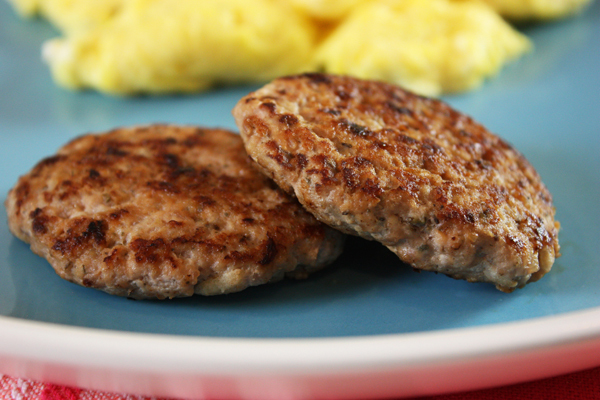 To try my easy, healthy turkey breakfast patties, click here for the recipe. 8 Comments on "Turkey Breakfast Patties"
Hello, is it necessary to include the apple.or something else I could use as a replacement. I’m curious where you find just dark meat to make these. Is that something every butcher should have? I don’t want to make a whole turkey, just to get the little bit of dark meat! In my experience when you buy ground turkey it is usually dark meat; otherwise, it would specify white meat. But check with the butcher. I have so much to learn! Thank you! Wonderful sounding recipe. Curious though, if I could make up a dozen, brown them in a pan, cool them and then freeze them individually on a pan and place in a baggie in the freezer? Then, when I need them, I could just nuke (microwave) one or two, enough to thaw and heat. Would that work? I need “fast” in the mornings with my eggs. 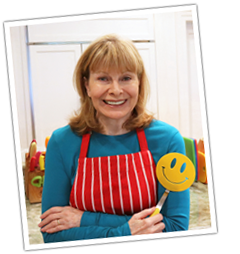 Thank you, I love your website and recipes. I was raised with a Polish family and adore your Polish recipes. I so remember it all! My husband is thrilled at the thought of my making your cabbage rolls! You teach so nicely. Debbie Greenfield, Palo Cedro, CA. Yes, you can cook and freeze them individually and then microwave as needed. This was so quick and easy. I am very impressed with your site and your humor. great . thank you for sharing. I look forward to trying more soon.